Despite the last Indian wicket falling on the first ball of day 2, the Indian bowlers displayed a consistent performance to decimate the Aussie batting line up. Mitchell Starc (8 batting) was giving Head company at the close of play with Australia trailing by 59 runs against India's first innings effort of 250 all out, the highlight of which was Cheteshwar Pujara's fighting hundred. Post-tea, the hosts lost two wickets for 10 runs in a passage of play spanning eight overs. It was credit to Indian bowling that it kept the runs in check and regular inroads into the Australian line-up meant that they were never really out of pressure. Peter Handscomb (34) had been living dangerously and he was the first to fall. He tried to play the late cut against Bumrah but only managed to edge behind. Shortly after, Ishant came up with an unplayable length delivery and Australian captain Tim Paine (5) had no choice but to play at it, only to edge to the keeper. Australia were struggling at 127-6 when things turned their way thanks to the eighth-wicket partnership between Head and Cummins. Head started to play more shots as soon as the tail-ender came to the crease, and in doing so, reached his second Test half-century off 103 balls. It was the only passage of play where India's bowling lost a little colour, but it was partly due to the fact that Murali Vijay (0-10) bowled four overs before the second new ball was taken. Cummins faced 44 balls until then but it didn't matter as Bumrah trapped him LBW. 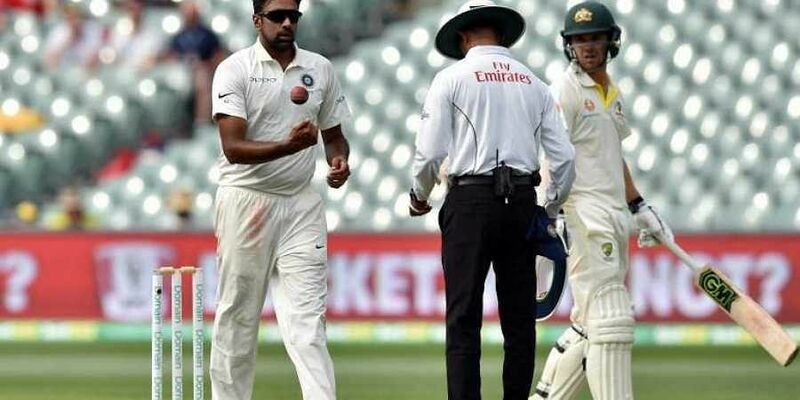 However, the Indian pacers were unable to make further inroads into the Australian lower-order as Head and Starc batted out the remaining overs before stumps. Earlier, Ashwin bowled with control as Australia were restricted to 117-4 at tea. The senior off-spinner bowled an incisive spell that tied down the Australian batsmen. First up, Shaun Marsh (2) gifted his wicket immediately after the break. In the very first over, he went for a wild slash against Ashwin but ended up playing on as Australia were reduced to 59-3. Usman Khawaja (28) and Handscomb then added 28 runs for the fourth wicket. The latter played some loose strokes at the start of his innings but got some streaky boundaries off Mohammed Shami (0-51) to help the scoring rate move along. The big moment came in the 40th over when Ashwin got Khawaja's wicket. The left-hander had been tied down and was content eating up deliveries. However, he pushed one forward against Ashwin and gloved it to keeper Rishabh Pant. India appealed, and then opted for DRS review with hotspot showing a faint tickle on Khawaja's glove as Australia were suddenly reduced to 87-4. Head then joined Handscomb and defied the Indian bowling, which didn't allow any easy runs but also couldn't find another breakthrough before the tea break. Handscomb struck five boundaries, while Head hit a four as well, as the duo put on 30 runs for the fifth wicket, taking Australia past 100 in the 48th over. In the morning, Australia were placed at 57-2 at lunch after India were bowled out for 250 (88 overs) on the very first ball of the morning session. Mohammed Shami (6) showed no patience at all and went after a short delivery from Josh Hazlewood (3-52) only to be caught behind down leg side, as India's innings came to a quick end. The duo batted out 20.4 overs and put on 45 runs for the second wicket, already higher than any partnership for the top-four Indian wickets. The Indian pacers bowled with fiery pace with Bumrah even breaching the 150kmph mark at one point. However, they bowled short of good length on most occasions and didn't make the Australian batsmen play too many deliveries. On their part, both Harris and Khawaja were content leaving as many deliveries as possible and struck only four boundaries between them. Ashwin was introduced into the attack in the 12th over of the innings and immediately hit up an interesting duel with Harris. The cover drive came out against the spinner, expectedly as a few more runs started flowing. Ashwin first struck before lunch. Harris played on to his pads and was caught at silly point in the 22nd over, as the spinner got dividends for blocking all scoring opportunities. Australia's 50 came up in the 27th over thereafter.